This week’s CPS sketch (#173) was a challenge! I’m not used to putting a lot of little images on a card or making a narrow card, but I gave it a try! Here’s the sketch in case you’d like to play along, too! For my card, I used a small teacup stamp from Elzybells Art Stamps to create the side images. 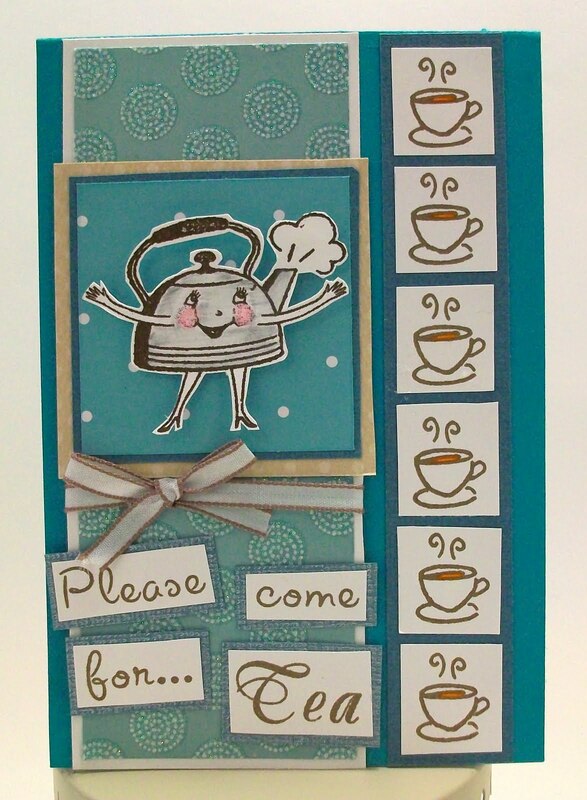 The teapot and sentiment stamps are from Crafty Secrets Clear Art Stamps. I used SU Soft Suede ink for the teacups, and Chocolate Chip ink for the teapot. The card base is SU cardstock, and the papers I used are SEI (glitter circle paper), American Crafts (polka dot), Core’dinations (gemstones cardstock to mat the sentiment) and Bo Bunny (Almond Double Dot). The ribbon is from Martha Stewart Crafts. I also used an orange glaze pen to create the tea inside the cups and I colored the teapot with colored pencils. This is darling! Love that cute main tea pot image! Great job with CPS Sketch 173!! The little coffee cups are just so cute and really work nicely with that CPS sketch.